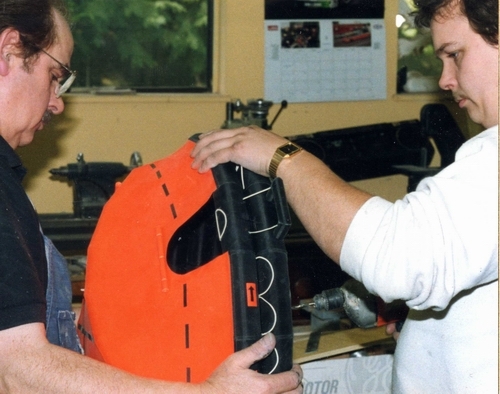 Dunlop Beaufort were the supplier of the Safety Equipment on the BC Super Ferries, and we worked very closely with them, receiving information necessary, to build the safety equipment, accurately, on the models, before the actual full size ferries were finished. 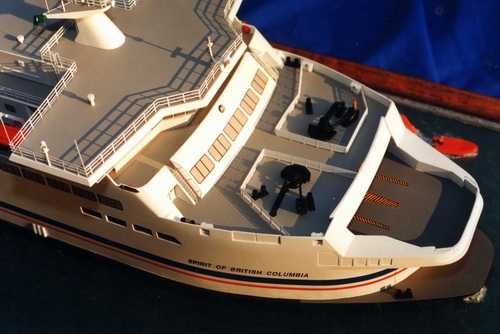 When we build the models, the ferries are very much at the design stage only, owing to the fact that the Corporation needs the models as early as they can get them, for promotional purposes, prior to the commissioning. When you study the models, and compare them to the actual vessels when completed, you will certainly find many differences. 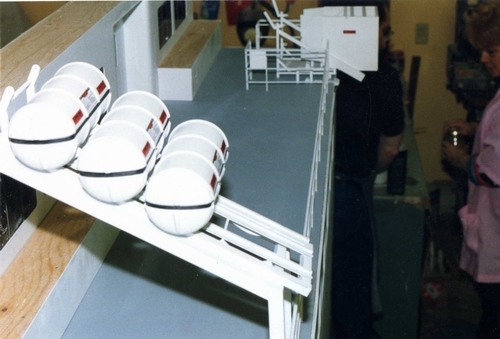 That is because many of the design decisions during outfitting are changed, after the models were built. 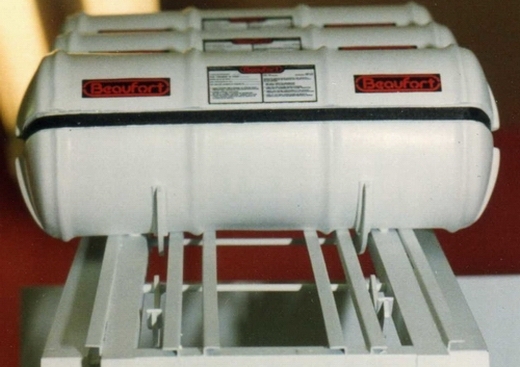 To have the complete cooperation and support from companies like Dunlop Beaufort, at the time of our construction was very important. 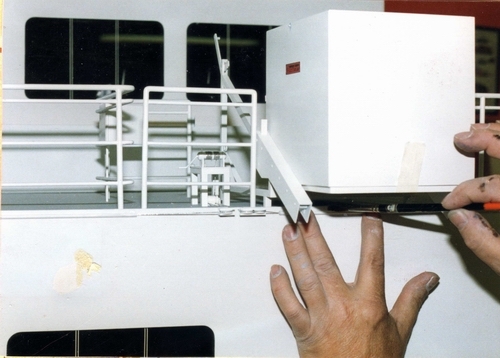 Drawings and Structural details supplied to us, by Dunlop Beaufort, during the Super Ferry model's construction, was invaluable. 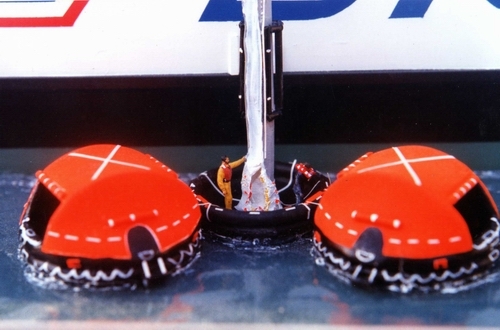 (left) Dunlop Beaufort commissioned us to build the 1:150 scale waterline model above, showing the deployment of the escape chutes, life rafts, and rescue zodiacs in action. 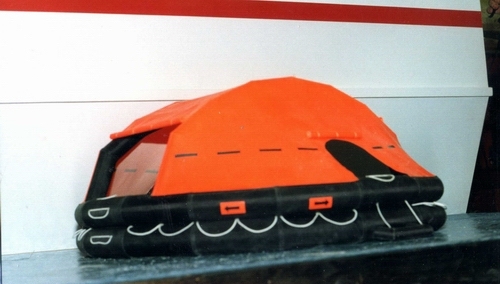 (Bottom) A giant model in 1:12 scale (1" = 1' foot) which traveled all over Canada, the U.S. and Great Britain, visiting Marine Safety Shows, to promote Dunlop Beaufort safety equipment. The model portrayed a section, approx. 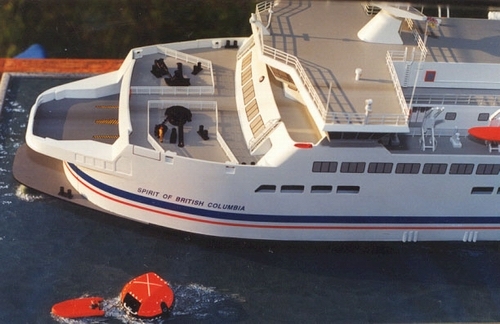 8/10 feet long (model size), of a BC Super Ferry, showing the passenger escape chute equipment deployed, and life rafts at water level. Great model and really a lot of fun to build.